World Soccer Talk published an interview with me this weekend, conducted by Drew Farmer. Below is a sample, and here's a link to the whole interview. 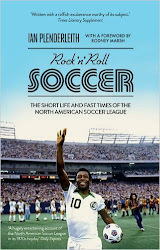 Drew Farmer: Near the end of the book, Rodney Marsh had a few quotes about the new NASL and Tampa Bay Rowdies. Ian, what are your thoughts on the revived league and can it return to something similar to the original league? Do you share Marsh’s thoughts on the league? "No, I don’t agree with Rodney on that one, though I can see why he denigrated it – he’s someone who’s used to top class football. That’s what he played, and that’s what he wants to see. For me, the more teams and leagues there are, the better. Personally, I’d watch anything (and I do) – I grew up watching Lincoln, Scunthorpe and Grimsby, after all. "I had a bit of a testy email exchange with the current [New York] Cosmos, though, because they objected to me referring to the new league as “semi-pro” in the book. That wasn’t intended as a putdown. In many respects, the old NASL, especially in its early years, was semi-pro too, at least according to my definition. That is, players played and were paid for less than half a year, at least until they started the winter indoor league(s). To me, semi-pro is when you have players on contracts that mean they have to work other jobs, because the break between seasons is several months long, or because the players are also coaching or working other jobs to make a living. There’s no shame in that for a brand new league in a country like the US. In that respect, many MLS players could have been classified as semi-pro until they re-negotiated the minimum wage in the latest round of pay negotiations. It’s not an insult, it’s just a reflection of a league’s status at this point in time. "Can it grow to the size of the old NASL? Again, I think that question doesn’t really apply. I think eventually it would be best if the leagues merge and we end up with two or three divisions with at least some form of relegation and promotion when that’s sustainable. The US is, after all, the ultimate meritocracy, or at least in theory. It can also be more protectionist than a Soviet planned economy. Right now, though, MLS and NASL seem to be in an unspoken competition, and from what I can gather at this distance, they’re not on especially good speaking terms."